On May 5th, we held our inaugural SOCCER FOR SARC event to raise awareness and funds for Sarcoidosis research. 100% of donations went to the Foundation for Sarcoidosis Research (FSR) for patient assistance and research. 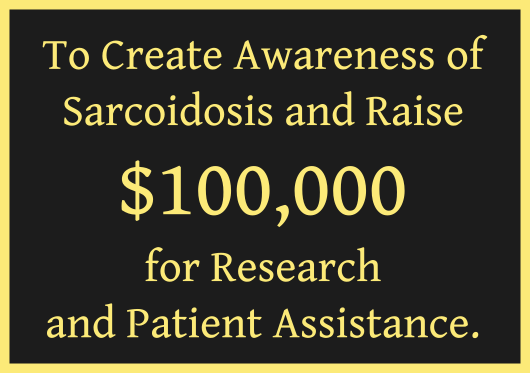 On behalf of the Foundation for Sarcoidosis Research, let me say “THANK-YOU” for the outpouring of support and generosity from all of you “sarccer” players and supporters for making our “Inaugural” Soccer for Sarc Tournament a huge success. We had over 50 players and supporters and we raised over $3,240 that will go toward continuing the search for a cure to this horrible disease that so few people have even heard of. Wow! Well done everyone! I’m not eloquent enough to put into words how appreciative I am for the support my soccer mates have given me over the last 5+ years. My wife commented that I am truly blessed to be surrounded by so many great soccer friends. I couldn’t agree more as I have the best support group of any patient I know. If you missed participating in your first ever Sarccer Tournament, I hope you will join us next year for our 2nd Annual Soccer for Sarc tourney. We promise to have some interesting surprises. And we’re always looking for ideas on how we can improve the event, so just let me know.